These are taken from the National Archives microfilm: call number 374NA, microcopy M841, Roll No. 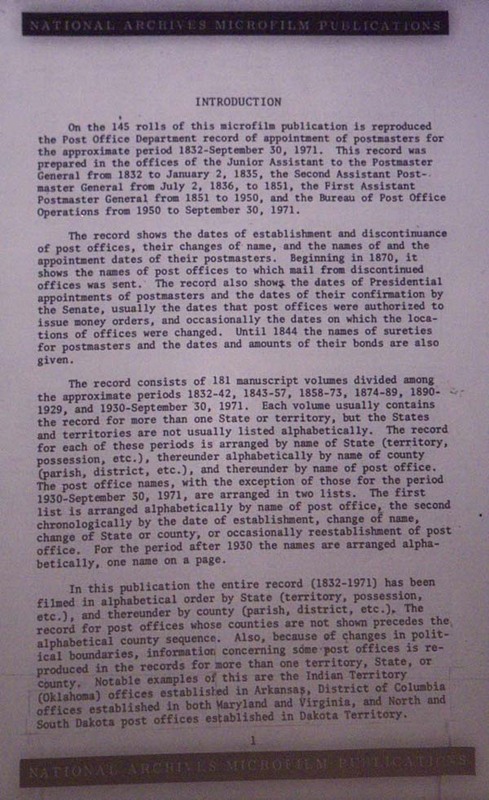 99, titled "Record of Appointment of Postmasters: Ohio, Delaware - Knox counties". Most of the writing is very clear, but a few names are questionable. In those cases I have offered a possible interpretation of the spelling followed by a question mark. I have re-arranged the listings from the way they appeared in the original record so that I could display them sorted by post office and postmaster. 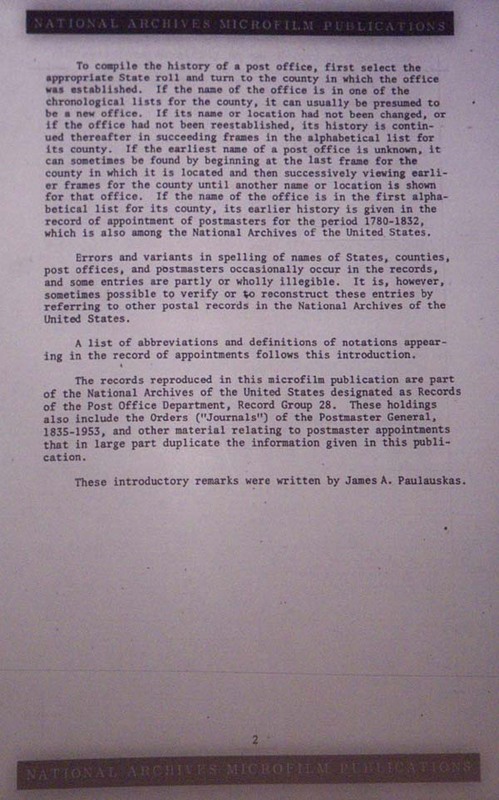 Click for an image of the first page of the introduction to the microfilm. Click for an image of the second page of the introduction to the microfilm. 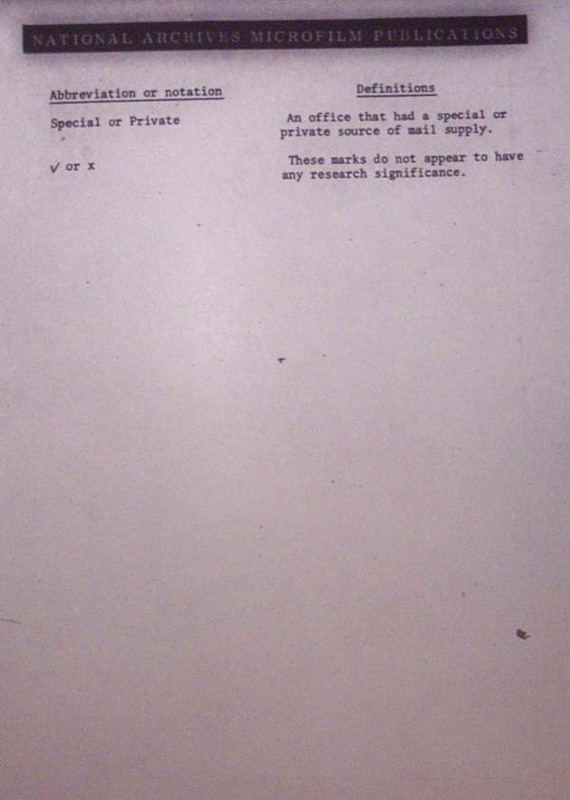 Click for an image of the first page of the list of some abbreviations found in the microfilm. Click for an image of the second page of the list of some abbreviations found in the microfilm. In addition I noticed there are some other unlisted abbreviations used. One is (PM) which means Postmaster. One is (Pres.) which means the same as (P) for President. One is (Rel.) which apparently means Released. One is (Res.) which might mean resigned or rescinded, depending on the context. I have just used it as found and not tried to interpret it. I have not copied the large number of N.B. dates that occur in the records, since they convey no information by themselves. They just direct you to a date where the Post Office or postmaster was mentioned in its Postal Bulletin publication. There may be useful info there, but you would have to look to see. Adam discontinued 20 Jul 1892 Mail sent to Glade. Agatha - 1850 P. O. in Vinton County. Allensville Cozad, Henry 12 Jun 1840 P. O. name changed from Rileyville. Allensville - 1850 P. O. in Vinton County. Banner discontinued 24 Dec 1898 Mail sent to Clay. Banner re-established ?? ??? ???? date not given. (my guess 14 Jun 1899)? Banner discontinued 06 Nov 1903 Effective 14 Nov. Mail sent to Clay. Berlin Cross Roads Salmans, Levi W. 28 Jun 1850 The P. O. name is also spelled Berlin X Roads. Berlin Cross Roads Erwin, Electa 28 Oct 1872? Date could also look like 1876? Berlin Cross Roads Fairall, Arthur P. 01 Feb 1917 Declined. Berlin Cross Roads Camink, John E. 02 May 1917 Confirmed. Died (apparently Sep. 1932). Berlin Cross Roads Camink, Charles L. 19 Sep 1932 Assumed charge. Acting PM 03 Oct 1932. Confirmed 22 Nov 1932. Commission signed 09 Dec 1932. 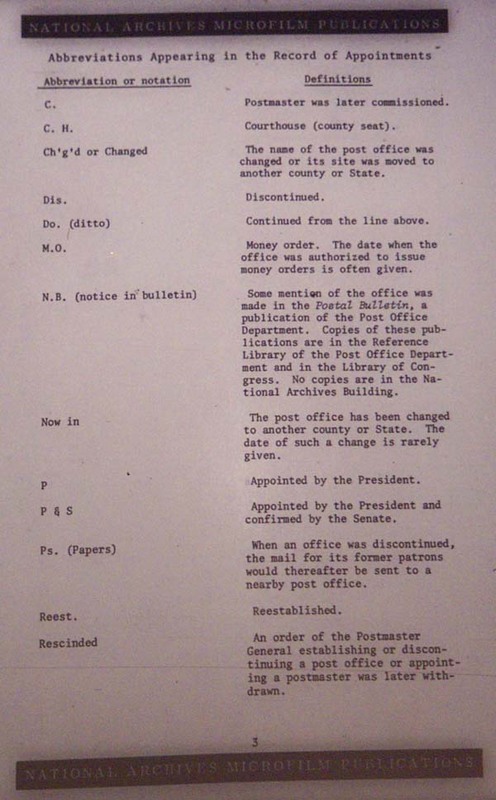 Assumed charge 09 Dec 1932. Berlin Cross Roads discontinued 08 Dec 1933 Effective 30 Dec 1933. Mail sent to Wellston. Blanche discontinued 25 Mar 1896 Mail sent to Coalton. Brocks Corner Penderton, Thomas M. 23 May 1864 Person's name is hard to read. Could be Penderton, Pemberton, Pinkerton or something else. Bud discontinued 13 Dec 1901 Effective 31 Dec. Mail sent to Camba. Burris Burris, Charles W. 02 Oct 1885 P. O. name changed from Volga. Burris discontinued 13 Jan 1898 Mail sent to Berlin Cross Roads. Byer Kennedy, Wm. W. 29 Nov 1882 P. O. name changed from Byer's Station. Byer Manring, H. Clyde 10 Jun 1930 Acting PM. Byer Skinner, Ralph 05 Sep 1931 Acting. Took possession 01 Sep 1931. Byer Skinner, Ralph 01 Sep 1931 Assumed charge. Acting PM 05 Sep 1931. Byer Doles, Foster A. 20 May 1932 Confirmed. Commission signed 28 May 1932. Assumed charge 31 May 1932. Rem. Byer Henderson, Evelyn M. (Mrs.) 11 Jan 1937 Assumed charge. Acting PM 29 Jan 1937. Byer discontinued 22 Apr 1937 Effective 15 May 1937. Mail sent to Wellston. Byer Henderson, Evelyn M. (Mrs.) 13 May 1937 Confirmed. Commission signed 02 Jun 1937. Assumed charge 01 Jul 1937. Res. W.O.P. Byer Perkins, Millie (Mrs.) 17 May 1939 Assumed charge. Acting PM 25 May 1939. Byer discontinued 19 Aug 1939 Effective 15 Sep 1939. Mail sent to Wellston. Modified 15 Sep 1939. Effective 14 Oct 1939. Byer Perkins, Millie M. (Mrs.) 13 Oct 1939 Confirmed. Commission signed 01 Nov 1939. Assumed charge 07 Nov 1939. Res. Byer Manring, Una Mae (Mrs.) 01 Apr 1942 Assumed charge. Acting PM 04 Apr 1942. Byer Manring, Una Mae (Mrs.) 25 May 1942 Confirmed. Commission signed 02 Jun 1942. Assumed charge 05 Jun 1942. Res. Byer Graves, Grace E. (Mrs.) 30 Sep 1955 Assumed charge. Acting PM 14 Oct 1955. Byer Milliken, Mabel (Mrs.) 31 Dec 1955 Assumed charge. Acting PM 04 May 1956. Byer discontinued 28 Jun 1957 Mail sent to Wellston. Camba discontinued 01 Feb 1907 Effective 25 Feb 1907. Mail sent to Jackson. Camba discontinued 15 Nov 1923 Mail sent to Jackson. Chapman Chapman, Horace L. 05 Sep 1888 P. O. name changed from Ennis. Chapman Eisnaugle, Thomas 10 Jul 1908 Appt. rescinded 06 Aug 1908. Chapman Eisnaugle, Thomas 30 Jun 1908 Rescinded. Chapman discontinued 15 Nov 1915 Mail sent to Coalton. Clarence discontinued 28 Oct 1898 Effective 15 Nov 1898. Mail sent to Hamden Junction (Vinton County). Clay discontinued 31 Aug 1912 Mail sent to Oak Hill. Coalton Winfrongh, Adam 08 May 1879 P. O. name changed from Eurekaville. Coalton Brohard, Evan G. 31 Oct 1924 Confirmed. Commission signed 14 Nov 1924. Assumed charge as acting 09 Apr 1924. Rem. Coalton Rowe, Merle Anna (Mrs.) 21 Jan 1935 Assumed charge. Acting PM 28 Jan 1935. Coalton Rowe, Merle A. (Mrs.) 27 Aug 1935 Confirmed. Commission signed 23 Sep 1935. Assumed charge 01 Oct 1935. Pres. 01 Jul 1944. Coalton Rowe, Merle A. (Mrs.) 23 Aug 1944 Nominated. Confirmed 08 Sep 1944. Apptd Pres 09 Sep 1944. Commission signed 09 Sep 1944. Assumed charge 19 Nov 1944. Cove Motz, John 13 Nov 1878 P. O. name changed from Meadow Branch. Cove Flaker, Oscar A. 06 Jul 1926 Confirmed. Commission signed 16 Jul 1926. Assumed charge 24 Jul 1926. Res. Cove Bennett, Alpha M. 28 Jun 1941 Confirmed. Commission signed 09 Jul 1941. Assumed charge 15 Jul 1941. Deceased 22 Nov 1949. Cove Boroff, Mary B. (Mrs.) 31 Dec 1949 Assumed charge. Cove Boroff, Mary B. (Mrs.) 12 May 1950 Confirmed. Commission signed 06 Jun 1950. Assumed charge 30 Jun 1950. Trans. to Clk. Jackson, O., 31 Aug 1960. Cove discontinued 31 Aug 1960 Mail sent to Jackson. Dawkin's Mills discontinued 28 Nov 1904 Effective 14 Dec. Mail sent to Wellston. Eastburn discontinued 29 Jan 1904 Effective 13 Feb. Mail sent to Jackson. Eckny discontinued 21 Oct 1902 Effective 31 Oct. Mail sent to Oak Hill. Ennis - 05 Sep 1888 P. O. name changed to Chapman. Ervins Mills - 24 Feb 1874 P. O. name changed to Leo. Esther discontinued 18 Apr 1901 Effective 30 Apr. Mail sent to Samsonville. Esther Baltzunat, Edward O. 12 Apr 1902 Rescinded 18 Sep 1902. Eurekeville - 08 May 1879 P. O. name changed to Coalton. Glade discontinued 31 Oct 1924 Mail sent to Beaver. Glen Roy - 12 Jul 1893 P. O. name changed to Glenroy. Glenroy discontinued 30 Jul 1921 Mail sent to Coalton. Grahamsville discontinued 27 Mar 1902 Effective 15 Apr. Mail sent to Weber. Herdman Cole, John W. 18 Nov 1895 Rescinded 08 Apr 1896. Herdman discontinued 30 Jun 1906 Effective 31 July 1906. Mail sent to Rempel. Hewit discontinued 21 Oct 1902 Effective 31 Oct. Mail sent to Oak Hill. Hillsdale discontinued 29 Jan 1904 Effective 13 Feb. Mail sent to Jackson. Howes Hill discontinued 17 Apr 1883 Mail sent to Jackson. Hughes - 01 Oct 1849 P. O. name changed to Keystone. Ivy discontinued 21 Mar 1901 Effective 30 Mar. Mail sent to Ray. Jackson (C. H.) Hollberg, Henry 18 Jun 1885 P. (P&S 08 Feb 1886). Jackson (C. H.) Sloan, Wm. H. 20 Jul 1889 P. (P&S 21 Dec 1889). Jackson (C. H.) Sternberger, Mark 04 Jul 1898 P&S. Reappointed 27 Jun 1902, P&S. Jackson (C. H.) Kyer, Thomas 23 Jun 1914 P&S. Reappointed 29 Sep 1918 P&S. Jackson (C. H.) Bales, Jesse L. 30 Dec 1922 P&S. Reappointed 04 Feb 1927, P&S. Jackson Bales, Jesse L. 04 Feb 1927 Confirmed. Commission expired. Reapptd. Jackson Kyer, Thomas 18 Apr 1934 Nominated. Confirmed 25 Apr 1934. Commission signed 28 May 1934. Commission expired. Jackson Kyer, Thomas 07 Jun 1938 Nominated. Confirmed 10 Jun 1938. Apptd Pres 23 Jun 1938. Commission signed 30 Jul 1938. Assumed charge 01 Jul 1938. Commission expired. Jackson Kyer, Thomas 04 Feb 1943 Reapptd. Nominated. Confirmed 25 Feb 1943. Apptd Pres 26 Feb 1943. Commission signed 06 Apr 1943. Assumed charge 01 Apr 1943. Deceased 20 Nov 1949. Jackson Bruce, Harry S. 31 Dec 1949 Assumed charge. Jackson Miller, Paul A. 12 Oct 1951 Nominated. Confirmed 20 Oct 1951. Apptd Pres 22 Oct 1951. Commission signed 22 Oct 1951. Assumed charge 30 Nov 1951. Jimes discontinued 06 Nov 1903 Effective 14 Nov. Mail sent to Oak Hill. Jordon discontinued 05 Sep 1899 Mail sent to Dawkin's Mills. Keystone Griswold, Edwin H. 01 Oct 1849 P. O. name was changed from Hughes. Keystone discontinued 28 Jan 1907 Effective 28 Feb 1907. Kitchen discontinued 30 Dec 1922 Mail sent to Oak Hill. Leach discontinued 09 Jul 1903 Effective 14 Jul. Mail sent to Ray. Leo discontinued 17 Mar 1904 Effective 14 Apr. Mail sent to Coalton. Limerick discontinued 23 Jan 1904 effective 13 Feb. Mail sent to Jackson. Mabee Frasure, Thos. A. 11 Jul 1892 P. O. name changed from Mabee's. Mabee discontinued 17 Aug 1904 Effective 15 Sep. Mail sent to Oak Hill. Mabee's Mabee, William 27 Sep 1849 Both Mabee names were spelled Maybee, probably incorrectly, then the "Y" was marked out. Mabee's Flaker, Jacob 08 Sep 1887? Date could be 1884?. Mabee's - 11 Jul 1892 P. O. name changed to Mabee. Meadow Branch - 13 Nov 1878 P. O. name changed to Cove. Milton Furnace - 17 Jul 1874 P. O. name changed to Wellston. Monroe Furnace discontinued 29 Feb 1884 Mail sent to Samsonville. Monroe Furnace discontinued 03 May 1890 Mail not to be sent. Needy discontinued 08 Oct 1890 Mail sent to Coalton. Oak Hill Massey, Levi 11 Mar 1837 Something is written very lightly above Massey's name and with a date of 18 Apr 1837, but I can't interpret it. Oak Hill Morgan, Wm. W. 04 May 1869 Middle initial could be 'M' but is probably 'W'. Oak Hill Wasmer, Frank 24 Jul 1913 P&S. Reappointed (P&S) 31 Jan 1918. Oak Hill Williams, Rossiter S. 16 Feb 1922 P&S. Reappointed (P&S) 04 Feb 1927. Oak Hill Williams, Rossiter S. 04 Feb 1927 Confirmed. Commission expired. Reapptd. Oak Hill Corvin, Carl S. 18 Apr 1934 Nominated. Confirmed 25 Apr 1934. Commission signed 15 May 1934. Commission expired. Oak Hill Corvin, Carl S. 07 Jun 1938 Nominated. Confirmed 10 Jun 1938. Apptd Pres 23 Jun 1938. Commission signed 02 Aug 1938. Assumed charge 09 Aug 1938. Commission expired. Oak Hill Corvin, Carl S. 11 Dec 1942 Nominated. Confirmed 16 Dec 1942. Apptd Pres 21 Dec 1942. Commission signed 23 Jan 1943. Assumed charge 01 Jan 1943. Retired 30 Dec 1964. Oak Hill Miller, Clinton E. 30 Dec 1964 Assumed charge as acting PM. Oak Hill Miller, Clinton E. 11 Jun 1965 Confirmed. Apptd Pres 14 Jun 1965. Commission signed 25 Jun 1965. Assumed charge 02 Jul 1965. Orpheus Sharp, Joseph E. 18 Dec 1902 Rescinded 05 Jan 1903. Orpheus discontinued 03 Sep 1907 Effective 14 Sep 1907. Mail sent to Rempel. Petrea discontinued 21 Dec 1901 Effective 31 Dec. Mail sent to Berlin X Roads. Ratchford discontinued 25 Feb 1907 Effective 15 Mar. Mail sent to Wellston. Ray Cox, George W. 26 Jul 1893 P. O. name changed from Ray's. Ray Essex, George B. 07 Mar 1922 Confirmed. Commission signed 05 Apr 1922. Assumed charge 25 Apr 1922. Retired 31 Jan 1940. Ray Brohard, Norman 10 Feb 1940 Acting PM. Assumed charge 01 Feb 1940. Ray Doles, Ray W. 26 Aug 1940 Confirmed. Commission signed 10 Oct 1940. Assumed charge 13 Oct 1940. Ray - 29 Oct 1940 P.O. changed from Jackson County into Vinton County. Ray - 15 Nov 1941 P.O. changed from Vinton County to Jackson County. Ray Ray, Gertrude (Mrs.) 07 Nov 1941 Acting PM. Assumed charge 30 Oct 1941. Ray Thacker, Harry E. 21 Apr 1942 Confirmed. Appt. rescinded 07 May 1942. Ray Ray, Gertrude (Mrs.) 26 May 1942 Confirmed. Commission signed 06 Jun 1942. Assumed charge 10 Jun 1942. Ray Ray, Gertrude (Mrs.) 17 Jul 1945 Nominated. Confirmed 28 Jul 1945. Apptd Pres 30 Jul 1945. Commission signed 30 Jul 1945. Assumed charge 30 Sep 1945. Ray Ray, Gertrude (Mrs.) 10 Jul 1947 Confirmed. Commission signed 04 Aug 1947. Assumed charge 01 Oct 1947. Ray Font, Gertrude (Mrs.) 22 Jul 1955 Name changed by marriage from Gertrude Ray. Ray's - 26 Jul 1893 P. O. name changed to Ray. Reed's Mills Burlingame, William 17 Oct 1832 It looks like "ton" was crossed out and "ame" written in the PM's name. It had originally been written, probably incorrectly, as Burlington. Reed's Mills Wilxox, Abm.? & Robbins, Chas. 08 Nov 1832 These names and date written very lightly above Burlingame's name. Reed's Mills - 1850 P. O. in Vinton County. Rempel discontinued 10 Jul 1916 Effective 15 August 1916. Mail sent to Oak Hill. Ridgeland discontinued 31 Jan 1903 Effective 14 Feb. Mail sent to Rockyhill. Ridgeland discontinued 19 Jan 1905 Effective 15 Feb. Mail sent to Jackson. Riley Cox, Sam'l? & Ankrom, Jacob 26 Aug 1833 These names and date written very lightly above Redfearn's name. Rileyville Redfearn, James 05 Jun 1837 P. O. name changed from Riley. Rileyville - 12 Jun 1840 P. O. name changed to Allensville. Riverton discontinued 18 Dec 1903 Effective 31 Dec. Mail sent to Wellston. Rocky Hill McClure, Thomas P. 16 Apr 1856 Name also spelled McLure in the records. Rocky Hill - 06 Jun 1894 P. O. name changed to Rockyhill. Rockyhill discontinued 01 Feb 1907 Effective 25? Feb 1907. Mail sent to Jackson. Rockyhill discontinued 21 May 1919 Effective 31 May 1919. Mail sent to Jackson. Samson - 08 May 1857 P. O. name changed to Samsonville. Samsonville Trago, William 08 May 1857 P. O. name changed from Samson. Samsonville discontinued 20 May 1920 Effective 31 May 1920. Mail sent to Oak Hill. Springer discontinued 30 Sep 1902 Effective 15 Oct. Mail sent to Jackson. Volga - 02 Oct 1885 P. O. name changed to Burris. Weber Gahm, Jacob 27 Oct 1873 Name was mis-spelled as Gham. Weber discontinued 31 Dec 1891 Mail sent to Cove. Weber discontinued 19 Aug 1902 Effective 30 Aug 1902. Mail sent to Cove. Wellston Ferree, Joshua E. 17 Jul 1874 P. O. name changed from Milton Furnace. Wellston Potter, Miner R. 02 Oct 1885 Reappointed (P&S) 05 Jan 1887. Wellston Hockett, Frank A. 13 Jun 1893 P. (P&S 07 Sep 1893). Wellston Barnhill, Hugh 14 Sep 1897 P. (P&S 12 Jan 1898). Reappointed P&S 13 Mar 1902. Wellston Shattuck, Adelbert E. 28 Feb 1906 (P&S). Reappointed P&S 06 Jun 1910. Wellston Dando, Elijah T. 03 Jun 1914 (P&S). Reappointed P&S 19 Sep 1918. Wellston Thomas, William E. 12 Dec 1922 (P&S). Reappointed P&S 04 Feb 1927. Wellston Thomas, William E. 04 Feb 1927 Confirmed. Commission expired. Reapptd. Wellston Thomas, William E. 04 Mar 1932 Nominated. Confirmed 10 Mar 1932. Commission signed 04 Apr 1932. Trans. to clerk 15 Feb 1934. Wellston Hogan, Charles M. 13 Feb 1934 Acting PM. Assumed charge 15 Feb 1934. Wellston Hogan, Charles M. 09 Jun 1934 Nominated. Confirmed 15 Jun 1934. Commission signed 24 Aug 1934. Commission expired. Wellston Hogan, Charles M. 14 Jun 1938 Nominated. Confirmed 15 Jun 1938. Apptd Pres 23 Jun 1938. Commission signed 24 Aug 1938. Assumed charge 01 Oct 1938. Commission expired. Wellston Hogan, Charles M. 04 Dec 1942 Nominated. Confirmed 16 Dec 1942. Apptd Pres 21 Dec 1942. Commission signed 22 Jan 1943. Assumed charge 01 Apr 1943. Res. Wellston Thomas, William E. 01 Feb 1951 Acting PM. Assumed charge 31 Dec 1950. Wellston Clark, James H. 03 Apr 1951 Acting PM. Assumed charge 31 Jan 1951. Wellston Bishop, Arthur B. 12 Mar 1952 Nominated. Confirmed 27 Mar 1952. Apptd Pres 28 Mar 1952. Commission signed 28 Mar 1952. Assumed charge 26 May 1952. Res. Wellston Rupp, George W. 28 Jan 1954 Acting PM. Assumed charge 31 Dec 1953. Wellston Rupp, George W. 02 Jul 1954 Nominated. Confirmed 16 Aug 1954. Apptd Pres 16 Aug 1954. Commission signed 16 Aug 1954. Assumed charge 30 Sep 1954. Retired 30 Jun 1958. Wellston Clark, James H. 09 Jul 1958 Acting PM. Assumed charge 30 Jun 1958. Term. 01 Sep 1961. Wellston Hollberg, Floyd F. 27 Apr 1961 Nominated. Confirmed 24 Jul 1961. Apptd Pres 24 Jul 1961. Commission signed 17 Aug 1961. Assumed charge 01 Sep 1961. Wilcox discontinued 21 Jun 1894 Mail sent to Coalton.